The Japanese street-wear brand A Bathing Ape -- otherwise known as BAPE -- is about to make you long for your elementary school days. They are opening a Sanrio/Baby Milo Pop-up Store for a limited time, starting on August 28, at the BAPE Store in SoHo. The beloved Sanrio characters are celebrating their fiftieth anniversary this year -- the company was started in Japan in 1960 -- so this collaboration is especially timely. 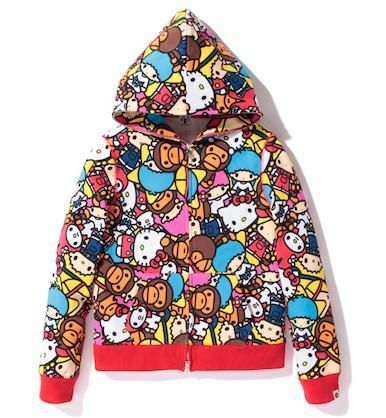 Items in the line will feature a number of Sanrio's most popular characters, including Hello Kitty, My Melody, and the Little Twin Stars, along with BAPE's own lovable monkey, Baby Milo. Pieces for both men and women will be available, including hoodies, tote bags, and several pairs of sneakers. So if you're anything like me, and couldn't head back-to-school without a knapsack full of Sanrio supplies, this might be the perfect fall nostalgia fix.